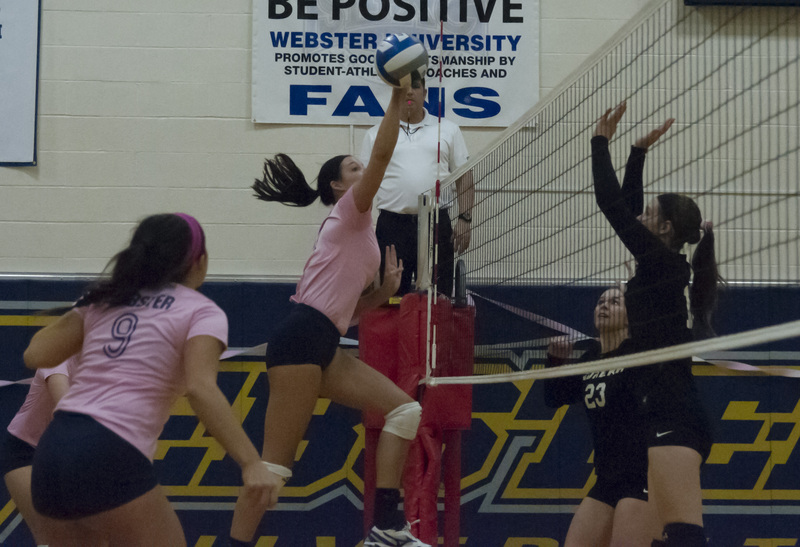 The Webster University Gorloks took down St. Louis Intercollegiate Athletic Conference foes Spalding University (Ky.) (25-17, 25-18, 25-16) and Eureka College (Ill.) (25-11, 25-8, 27-25) each in three straight sets Oct 12. at Grant Gymnasium. Volleyball head coach Merry Graf said she thought the team played well in both games, but could have played better. When Graf substituted her starters in the third set against Eureka, she said the team didn’t execute. “We made a lot of mistakes, and it showed by the (third set’s) score,” Graf said. Freshman libero Katie O’Toole set a school record with 50 digs against Augustana College (Ill.) on Oct. 11. She said the team performed well in todays games. O’Toole was a defensive specialist before she took over the libero position, the change took away her ability to attack in the front row. O’Toole said she is used to playing libero because she played the position in high school at Lutheran South. Prior to the match against Augustana, O’Toole was averaging 17 digs over her last four games. She is currently tied for 28th in the SLIAC with 126 digs. It was “Dig Pink” day for the volleyball team. The team wore pink uniforms in support of the fight against breast cancer and raised money for the Side-Out Foundation. The Gorloks improve to 18-4 overall, and are second in SLIAC play with a 11-1 record. The team wraps up its six game home-stand against Principia College (Ill.) Oct. 15 at 7 p.m.